The little spiritual trick I’ve used most often (so far in this life), is one that I’ve adapted from Hannelora (a radiant and joyful spiritual teacher based in Vancouver). Her website is http://www.hannelore.ca for those who may be interested. She teaches courses on developing your intuition, provides in person and telephone counseling and also hosts swimming with dolphin retreats in Hawaii. Hannelora’s connection to the divine makes being in her presence a healing and inspiring experience. I’ve taken two courses with her, and for the second one, I was lucky enough to be part of a very small class, which met in her West Vancouver home. This grounding and centering exercise is one that I try to do at least once a day, preferably upon awakening, or when I hit the shower in the morning (or early afternoon). I also do it quickly whenever I’m feeling a bit off balance. Once you are familiar with the routine, you can do it quickly, in seconds, anywhere anytime. But to start, please give this a try in a quiet place with no distractions. See your higher self, a brilliant, indistinct figure of white light in front of you. Breathe the light into yourself, and feel it permeate all of your being, blending your energies. Feel roots coming from the soles of your feet and the base of your spine. They travel down, into the earth for some time. Once they stop moving, earth energy comes back up through the roots, up through the soles of your feet, through the base of your spine, up your legs and up your body bursting through the crown of your head, and cascading over your shoulders like a waterfall. Then, a column of white light comes down from the divine, through the crown of your head, down your spine and out the base of your spine and soles of your feet, into the earth. These two energies, from the earth and from the infinite run through you, connecting you and each other- perfectly balancing you between the infinite and the manifest. 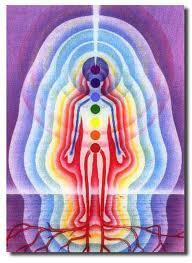 The white light then surrounds you in a shield, protecting you from all negativity. Feel the warmth and strength of this energy in you and surrounding you. Take a deep breath and open your eyes, refreshed, energized and ready to face the world with love in your heart.